Perhaps the oldest home still standing in Newfoundland is located on Green Pond Road. The original section of the house was erected in 1732 by a member of the DeMouth (DeMont) family. There is a strong possibility that the family had originally built a log cabin before constructing the substantial stone cottage. In that era, the family would have shared the land with tribes associated with the Lenni Lenape Indians. For years the home was referred to as the “Stone Cottage” and there must have been quite a settlement in Newfoundland prior to 1730, or a structure of that kind would not have been undertaken. 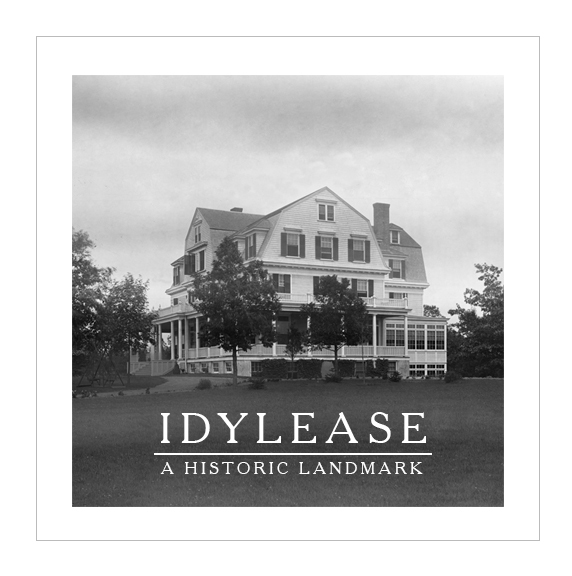 These lands would be inherited by the wife of Peter Snyder, who expanded the house in 1773. Several generations later, the Cole, Davenport, Brown, Eckhart and Kanouse families would emigrate to Newfoundland from England & Germany. 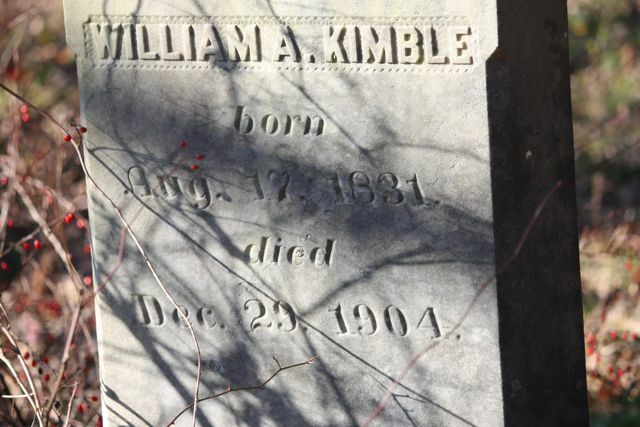 A sister of Leonard Cole married Israel Holley and verbal history in 1902 suggested that the Indians carried away one of their children, who grew up with the local tribe. The local 19th century historian, J.P. Crayon reasoned that Dutch settlers came to Newfoundland as early as 1715 because of the existence of records that indicated that Dutch ministers were dispatched to Newfoundland and held services throughout the region. Those same ministers would eventually organize the First Baptist Church of Newfoundland and The Presbyterian Church of Oak Ridge. The towns of Clinton and Charlotteburg would also be included on the circuit where ministers would visit. 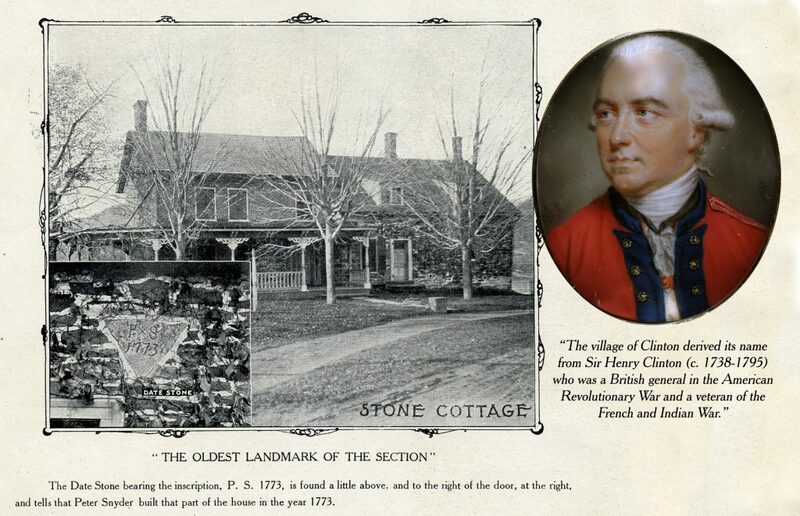 The village of Clinton derived its name from Sir Henry Clinton (c. 1738-1795) who was a British general in the American Revolutionary War and a veteran of the French and Indian War. The Town of Charlotteburg was named after Charlotte of Mecklenburg-Strelitz (Sophia Charlotte; 1744 – 1818) who was the wife of King George III. She was Queen of Great Britain and Ireland from her marriage from 1761 until 1818. A Revolutionary War Furnace still remains submerged under the Charlotteburg Reservoir which had been built in 1768 and was operated by Hessian soldiers. Many of these Hessians remained in the area after the war and settled at Macopin, where they established the first Catholic Church in New Jersey that would become St. Joseph’s. Frank Blundell of Jefferson Township, merit badge counselor for the Morris-Sussex area council of the Boy Scouts of America, shows boys from West Milford Township some things about scouting at the West Hudson District Boy Scouts of America camp-out that was recently held on the grounds of Idylease in Newfoundland, NJ. 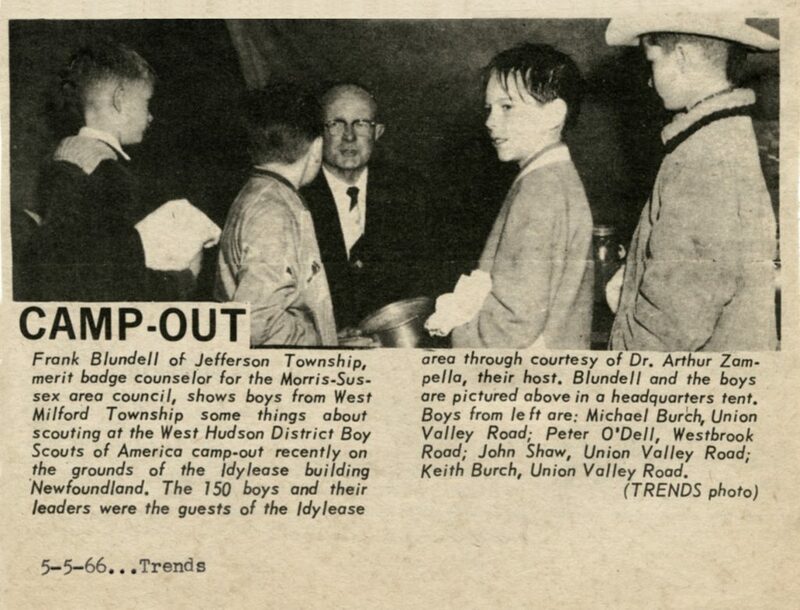 The 150 boys and their leaders were the guests of Idylease through the courtesy of Dr. Arthur Zampella, their host. Blundell and the boys are pictured above in the headquarters tent. Boys from left to right are: Michael Burch, Union Valley Road; Peter O’Dell, Westbrook Road; John Shaw, Union Valley Road; Keith Burch, Union Valley Road. In 1988, Dr Arthur Zampella was awarded with the Silver Beaver by the Three Rivers District of the Boy Scouts of America. The award was introduced in 1931 and was established to distinguish service to the Boy Scouts of America. Recipients of this award are registered Scouters who have made an impact on the lives of youth through service given to the BSA and to those who perform community service through hard work, self sacrifice, dedication, and many years of service.